Biotechnological applications of toxic marine dinoflagellates include seafood safety and biomedical, pharmaceutical and research purposes of their toxins among other bioproducts and bioactive compounds that they produce. The supply of sufficient quantities of phycotoxins for investigational uses remains in demand. Some of these toxins, available in small amounts, are quite expensive while their chemical synthesis is complex and costly. However, some quantities of these toxins could be produced with mass cultures of the appropriate dinoflagellates, which are however difficult to handle. Prorocentrum lima is a cosmopolitan marine dinoflagellate, which synthesizes toxins that cause a diarrheic syndrome to humans through the consumption of contaminated shellfish and fish (Diarrheic Shellfish Poisoning, DSP). 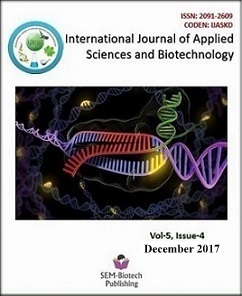 The aim of this study was to design and develop a biomass upscale system for the production of the lipophilic toxins okadaic acid (OA) and dinophysistoxin 1 (DTX1) from the produced biomass of Prorocentrum lima. In our study, P. lima was grown in large scale semi-continuous cultures under controlled laboratory conditions. The maximum biomass produced was 20690 cells/mL. Maximum toxin production was 63.66 ng/mL for OA and 8.07 ng/mL for DTX1. Toxin quota in P. lima cells was 88.7% OA and 11.3% DTX1. The produced culture volume was 300 L and the total volume capacity of the upscale system could reach 500 L.